Nicholas Tse Ting Fung, Jung Yong-Hwa and Michelle Wai Sze Nga starred in the film COOK UP A STORM (KUET JIN SIK SUN), which will open on February 10th in Hong Kong. Yesterday the trio promoted their new film with a HK$ 10,000 dish of beef chow fun to raise fund for charity at a Central street stall. 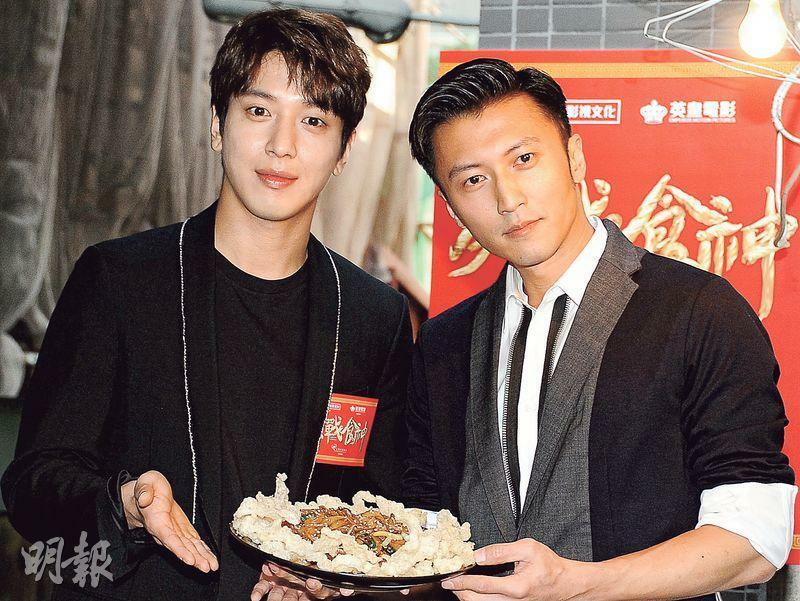 Yong-Hwa said that while acting with Ting Fung they had no language barrier, they were even unable to get the take in one try. Ting Fung said that he made "crispy beef tendon chow fun", which he has improved upon and could not be had at other street stalls. He even made at least three dishes and used black truffle salt, making them even more valuable. Finally each dish of the beef chow fun was sold for HK$ 10,000 to raise fund for Redford Charitable Foundation. Yong-Hwa and Sze Nga gave away cookies to the guests. Later Ting Fung sad that he really liked the street stall's cooking sounds and cheerful atmosphere. When he was little and lived in Shatin he often went to the nearby Lung Hang Estate's street stalls. 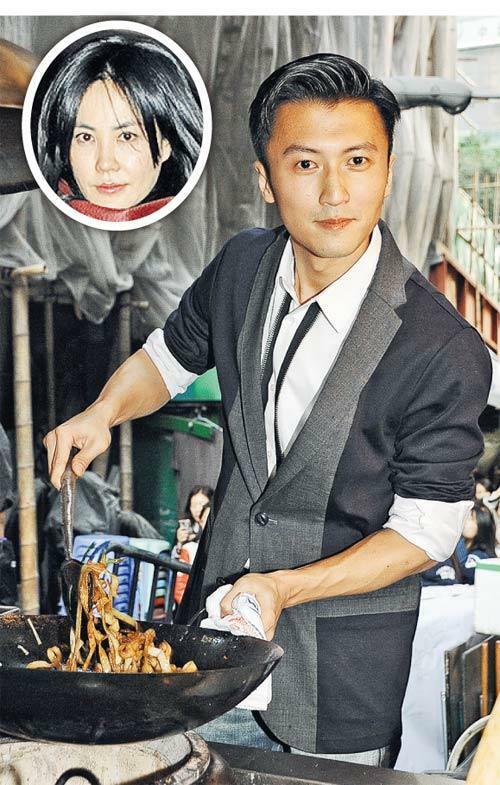 Ting Fung also revealed that he tried cooking with the street stall stove top, which he joked was like catching bugs. "Today I am dumb, I wore a pair of torn pants here. When I turned on the stove top with my leg, suddenly I felt very hot." Playing an assistant in the film, Wai Sze Nga said that she was responsible for tasting today. She tried a piece of beef tendon. "A dish of beef tendon chow fun costs HK$ 10,000, I had a piece that must be worth HK$ 1,000." She said that it felt like beef jerky. Ting Fung said that the beef tendon was full of collagen, which was good for girls' skin. This time he used a healthier way to cook, so the collagen was preserved even better. Did Sze Nga learn cooking from Ting Fung? She stated, "During the shoot Ting Fung really cooked, I learned but it was too complicated. I gave up. What was the most amazing about him was that he made the food as pretty as artwork." Suddenly she even asked if Ting Fung accepted students. Ting Fung smiled but did not answer. Yong-Hwa said that making COOK UP A STORM made him interested in cooking, now pasta was his best dish. Did he want to learn any New Year dish? Yong-Hwa stated, "I really want to learn, I want to learn to make dumplings the most." Did he learn from Ting Fung? He praised Ting Fung on his apple tart, which was so delicious that he still remembered it today. Ting Fung immediately said that it was very easy to make and could teach Yong-Hwa. "I also made an online platform to teach everyone to cook both Chinese and foreign dishes." In the film they had a scene in which they had three and a half pages of dialogue. Ting Fung said that he spoke Chinese while Yong-Hwa spoke Korean. Although they did not understand each other, they only rehearsed once before and he was worried, that scene did not end up in a bad take due to language problem. How did Yong-Hwa perform without understanding? He stated, "I didn't understand Ting Fung's lines, I relied on remembering Ting Fung's expressions and tone during rehearsal to follow along." Later, Ting Fung was asked about the Mainland media's photo of him kissing Faye Wong on the cheek at the airport. He answered, "Really! Oh! (You guys are so sweet!) Oh!" Will they spend the Lunar New Year together? He stated, "I am not answering questions like those." However he said that he will remain in Hong Kong for the Lunar New Year, then he will promote the film on the 18 city tour.